Since every person on the planet has a carbon footprint, controlling the number of people on the planet and their rate of increase, is essential to control CO2 emissions. Population growth rates, family planning, family size, religious beliefs, political correctness, personal liberty, aid funding, abortion beliefs, laws and philosophies, are all emotive issues, that tend to be sidestepped by all sectors of the community, politicians and aid workers alike. While I accept these difficulties, it is essential to look at the numbers and decide action based on cold reason and human compassion. The world’s population is presently 7.6 billion. It is due to rise to 10.9 billion by 2100, if statistician’s estimates are correct. Would the factors contributing to global warming, sea level rise and climate change be lessened were our population smaller? Will an increasing number of people on earth enhance our world, or degrade it by competing for space, resources and wilderness areas? Is there a link between the number of migrants attempting to come to the UK and population growth in their countries of origin? Are high rates of population growth linked to greater poverty, increasing numbers of jobless and degradation of the environment? If we in the UK are as compassionate as we like to think we are, should we not open our country to any migrant that is struggling to achieve a decent lifestyle in their own country? If you are a woman, would you like to have 9-14 children, or would you prefer just two? Many countries have a culture where large family size is the norm. Is this good for the family or the country, if the country is poor? Why do migrants from high birth rate countries often have family sizes larger than the UK average, when they come to Britain? In countries divided by race, religion, tribe or wealth, does large family size associated with one sector make those in other sectors anxious? If one country has a static population, and its neighbour has a rapidly expanding one, is the static country morally obliged to take in some of its neighbour’s population? In the early 70s, Oxfam regularly claimed that family size in African countries would reduce to 2-3 children as their country’s wealth grew. Why has this not happened? In the 70s, people often said that aid to the third world served only to keep poor people alive, so that they would go on to have more children. This would make a bad position even worse. Has this assertion been validated by events? In my correspondence with a certain aid agency over the years, I have suspected that they fear donations would drop if they required family planning to be part of their aid giving. Do you think this is true? Is the technology to reduce conception known and, if so, is it very expensive? People say that we need to produce more children to look after the growing number of old people, as they are living longer. Is this approach valid? China had a one child per family rule for a period; has elderly care there collapsed as a result? While there has been concerns about female infanticide, had China not acted as they did, what would the population be now? Without going through these questions one by one, it is obvious that we have the technology to limit family size, but lack the will, the infrastructure, and the courage to do this. It is very likely that conflicts caused by over population, and more migration from poor to rich countries will occur, all because we took the easy course not to act. The link between poverty and birth rate, particularly in Africa, is clear. The birth rates in the world are shown in Figure 1. 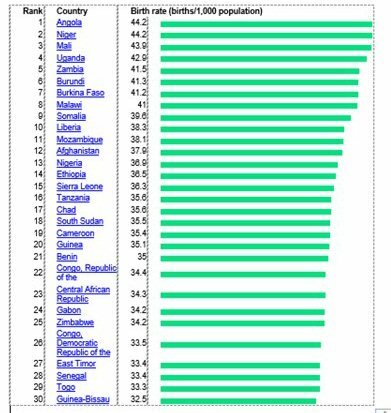 This data set shows that of the 30 countries in the world with the highest birth rates, 26 are in Africa. 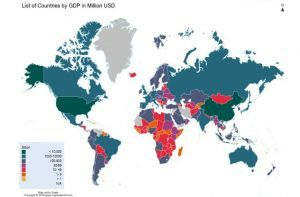 A look at a map of Gross National Product per capita (GNP) , shows the areas of high birth rates and low GNP coincide. On a personal basis, when I was in Nigeria in 1966-7, the population was 80 million. The country seemed to me to have too many people, many being children, to give them the chance of a decent life. Now, in 2016, it has 187 million of a population and rising. Many young men have no work, so do you blame them from trying to make their fortune in the UK. UN estimates of population (UN 2012) are shown in Table 1. The frightening increases in population are in Africa and Oceania. As a nation we agonise about caring for refugees fleeing their oppressors. How many to let in? Then the problem of deciding how many economic migrants to let into the UK. If we don’t let them in do they simply drown in the Mediterranean trying to enter illegally? These people are desperate for some sort of positive future. Erecting walls or fences, blaming our politicians, forming far right white supremacist groups are all to no avail. These young men, and in the main they are men, are desperate. These men have no jobs, have little prospects of work or marriage, they are trapped in villages or slums, going nowhere. Surely heading for the UK must be better. Sadly, African countries have never really taken off like those in Asia. There is little government infrastructure, corruption is rife, and factories and job opportunities are few in number. 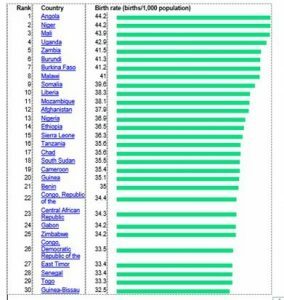 These poor countries are being held back by their high birth rates, poor government infrastructure and corruption. However, the last thing we should do is to form a second wave of colonialism, where we try to impose our own mores, religious values or views on abortion. This is a matter for the country’s own population to sort out, not us. Where we do have rights and responsibilities is in attempting to stem the flow of economic migrants to the UK. It is in our joint interests with these poor countries both to safeguard the planet and to avoid even greater overcrowding of our already overcrowded country. Our aid money should be channelled to prevent runaway population growth, to give the country a real chance to develop as well as reducing the impetus from young men from these countries to migrate. Instead of aid of the traditional sort, we should offer to help, but only on strict financial terms. A change from a do-gooding approach to a business deal. An agreement would be developed with the country’s leaders and since child birth is involved, as Amelia Womack, deputy UK green party Leader has recently suggested, these leaders should include women. The UK would pay the country money in return for the country reducing its birth rate. If there is no reduction, the contract will terminate. Full auditing of expenditure would be the responsibility of our government. Any leakage of monies to corruption would be identified and funding withdrawn. The aid would be secular in nature, which might exclude charities with agendas relating to abortion and family planning. These are decisions and approaches that must be controlled by the country concerned. But there should be no doubt, that this is a business deal; no result no income. I = P x A x T.
For example, a small population with a high level of affluence can have as much of an environmental impact as a large population with a low level of with affluence. If a steel mill is old and inefficient, its environmental impact will be higher than if the mill is of the latest technology. In the same way that we in the UK has a vested interested in helping poor countries keep their population growth rates to a sustainable level, we have a vested interest in ensuring that poor countries have the best level of technology possible, to ensure that they can become more affluent, but with minimal production of CO2 emissions and environmental impact. Since traditionally poorer countries are now manufacturing what at one time we made, we should ensure that they have the latest technologies at their disposal. In a mathematical model (Figure 3) to predict the level of food security across the world (Dawson, T.P., et,al., 2016), Prof Dawson shows that there will be extreme areas of food undernourishment in the areas shown in red. This includes large swathes of Africa, Australia, South America, Mexico, Saudi Arabia, Eastern Mediterranean and the UK. This assumes a business-as-usual scenario in terms of agricultural production, food consumption and predicted population growth. What is particularly interesting is that China and India are not in this red zone. They have achieved a sustainable population and food consumption regime. While the UK and Africa has not achieved this, it shows what can be done. Dawson, T.P., Perryman, A.N. and Osborne, T., (2016). Modelling impacts of climate change on global food security, Climatic Change, 134 (3), 429-440. Online: DOI 10.1007/s10584-014-1277-y. Ehrlich, Paul; Ehrlich, Anne, (1991). The population explosion. Pp 320. Arrow Books Ltd. London.